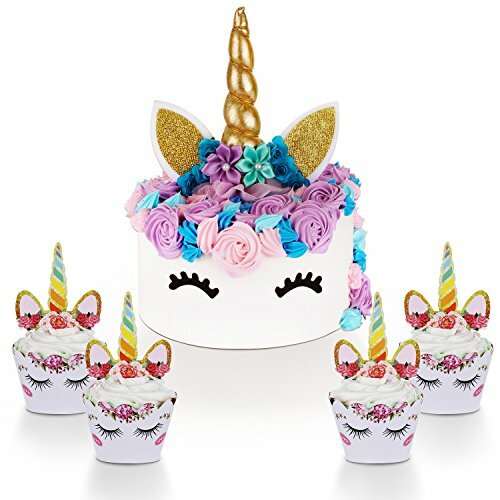 This unicorn cake topper kit includes: 1 unicorn cake topper with eyelashes + 24 double-sided cupcake toppers + 24 unicorn wrappers. Unicorn cake topper measures 5 inches tall + 5.2 inches wide fit for 8 to 12 inches cakes. Each unicorn cupcake topper measures 4 inches tall + 2.8 inches wide making it suitable for small - large size cupcakes. Cute Birthday Party Decorations, it's all about the unicorns and rainbows over here! This gorgeous unicorn cake topper instantly embellishes any birthday cake. The unicorn birthday cake topper is the perfect finishing touch for any unicorn party or unicorn birthday theme. This unicorn cake topper help create a great atmosphere and make the birthday party perfect. It's perfect for birthday party, baby showers, wedding, unicorn theme party, cosplay party, halloween.